Protein shakes are a great way to reach your daily recommended intake of protein (about 45g a day for the average sedentary woman), but they're not for everyone. Some people don't like the texture, some find them too thin, others find them lumpy (though that's usually down to the brand), and some people just don't like the repetitive flavours. A lot of the time they're chocolate-based, and if you're not one for chocolate shakes, then vanilla or strawberry are often your only alternatives, and I've come across quite a few poor vanilla ones, and I have yet to find any strawberry shake that I enjoy drinking - though, I find they go amazingly well in porridges. But if you're one of these people who hate protein shakes, then I've got something for you: ProWater. Protein water sounds strange, especially when it gets its protein from whey like shakes do, so it conjures the idea of a thin and disappointing shake with weak flavour, over-diluted and such, and it doesn't make me want to drink it. But when you look past that and view it as a high-protein fruity drink, suddenly you're in a new world. 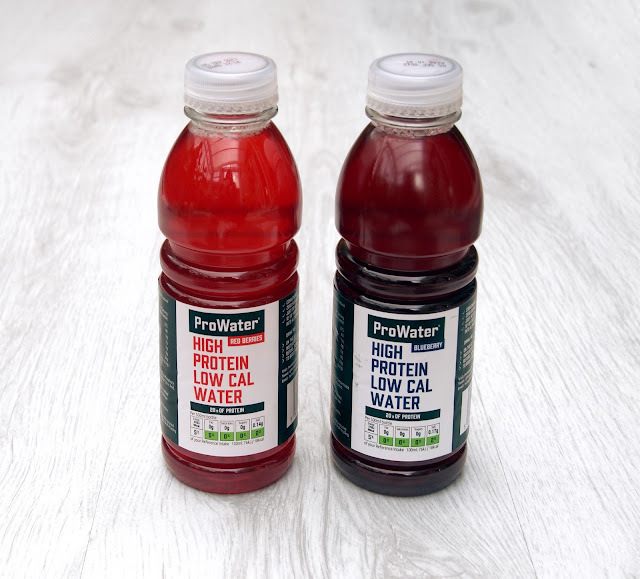 ProWater is a protein-packed fruit water, and unlike a lot of protein shakes, it has a tiny ingredients label due to lack of thickeners and the like. ProWater gets its protein levels - 20g per 500ml bottle - from whey and collagens and its natural flavours and colours from fruits. It's caffine-free, sugar-free and just 90 calories per 500ml bottle, and as it's fat-free and carb-free, it makes it a wonderful addition to an otherwise low-protein lunch, like a wholegrain and veggie sandwich, or instead of water for a high-protein base for smoothies with avocado, banana and greens. It comes in blueberry, red berries and citrus mint flavours, with no chocolate or vanilla in sight, so there's something to suit any smoothie! I've tried a few of these, and the blueberry is to die for. I usually drink water, green tea and herbal tea, so I'm not used to such sweet drinks - even as a child I over-diluted my squash - so I was a bit surprised by the sweetness, but it was neither unpleasant nor craving-inducing, which is great. It's a perfect replacement for ready-to-drink shakes so it's quite welcome in gym bags, and as most shakes are around 250ml, ProWater encourages you to drink twice that which, of course, improves your hydration. ProWater is new on the market but you can already find them in Superdrug stores, so they're not hard to come by, and with 10% of profits donated to help fund research on Alzheimer's and dementia, it's a do-good feel-good drink! Oh, but when I said I 'have something for you', I was being literal. I've got a bottle of blueberry ProWater and red berries ProWater to give away to one reader, and all you need to do is fill in the rafflecopter widget below - comment, follow, like, tweet; all the usual. Due to the edible nature of the product, this giveaway is regretfully only open to residents of the UK and EU, but I will have a worldwide giveaway here soon! This ProWater giveaway closes on November 3rd, and all entries will be checked when a winner is picked - all of that person's entries. Play fair, guys; don't lie! Oh, and don't forget to sign up to my Christmas sock exchange, too! Remember: it is important to keep fats and carbohydrates in your diet, whether you're trying to lose weight or to keep fit and healthy! Why? Because your body uses fats to protect cells and organs, and carbohydrates are your main source of energy. You should never cut either of them out.